Crushed peppercorns can also be referred to as Cracked peppercorns and are whole dried peppercorns that have been ruptured into small coarse pieces as opposed to ground pepper, which results in a finer powder. The versatility of cracked peppercorns is unrivalled, as the crushing releases the rich, hot and fruity flavours imparting a subtlety and warmth to your cooking. Any type of peppercorn can be very roughly ground into crushed peppercorns or pounded using a mortar and pestle, fracturing the peppercorns and creating cracked peppercorns. 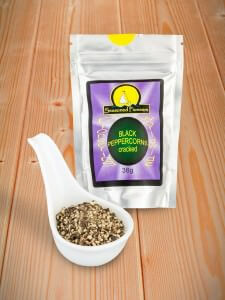 Peppercorns in either format are invaluable for use in sauces, casseroles and as rubs, particularly on peppered steaks. Crushed peppercorns are also frequently used as a table condiment for general seasoning. We use the very finest quality peppercorns to make our cracked black peppercorns. Supplied in our signature resealable foil pouches, they are the essential ingredient to have to hand in your kitchen, offering ultimate convenience.